The Lord is constantly there, always waiting for an opportunity to forgive us, be gracious to us and receive us into His Life and Joy. The tragedy of Saul’s life is that to the bitter end he chose to go his own way instead. The Lord did not rejoice at the death of the self-absorbed, manipulative man. Instead, He grieved. 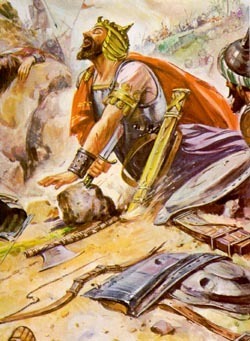 1 Samuel ends with the death of king Saul, recorded in chapter 31. While David was returning home, and then pursuing the Amalekites who had destroyed his town and taken his family, the Philistines and the Israelites began a great battle. As I mentioned before, the Philistines were in the valley of Jezreel, which was the only relatively easy way to get from the Mediterranean coast into the Jordan Valley of Israel. Saul’s forces were on a mountain ridge to the south of the valley, a place called Mount Gilboa. When the Philistines began to move east toward the Jordan, Saul moved to attack them and block them. The picture below is of the actual area (with present day roads, reservoirs and buildings that would not have been there at the time, of course). The Philistines were invading through the valley in the left of the picture, starting in the foreground and pushing toward the Jordan valley in the distance. The Israelites were positioned on the ridges to the right. 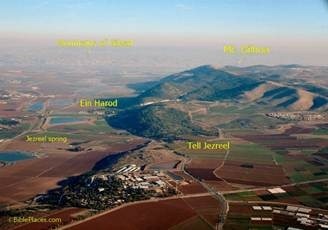 The little hill labeled “Tell Jezreel” was probably not there. The “burden” of battle could be intense physical combat. However, that doesn’t make sense when we learn that the enemy archers have only just come into range. If he was fighting hand to hand, archers would be irrelevant. They would not shoot, for fear of hitting their own men. So Saul was not even involved in actual combat. Therefore the “intensity” of the battle, was purely psychological for Saul. It says that Saul was deeply traumatized. We already know that the intensity of the battle is psychological for Saul, not physical. “Traumatized” can mean physically wounded of course, and it isn’t wrong to translate it that way. Even so, knowing that what is happening with Saul is already psychological, it is not wrong either to interpret the trauma as emotional distress, rather than a physical wound. I believe that this is reinforced by his armor-bearer’s response, when Saul asked him to kill him. The armor-bearer would not kill Saul, “because he was terrified,” (verse 4). What was he afraid of? If Saul was mortally wounded, why would the armor bearer be afraid to finish what was inevitable anyway? No, I think Saul’s mood and his words are what scared the armor-bearer. The night before the battle is when Saul went to the witch of Endor, and consulted with a demonic spirit who masqueraded as Samuel. If you remember, that spirit had spoken only words of condemnation and despair to Saul. Saul accepted this message and believed it as if it was truly Samuel speaking. So, here’s how I think it went down: You have a man who has his entire life been insecure, erratic and manipulative. He is a control freak in a situation where he does not have control. He has recently accepted and believed the words of a demon. He is deeply emotionally troubled by the battle long before it even comes near him. 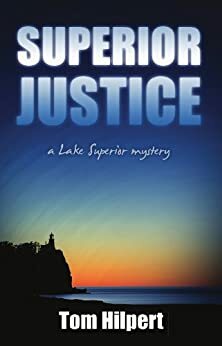 When he sees that the archers are finally in range, he suffers deep psychological trauma – and then takes his own life. In other words, he gave up even before all was truly lost. The words of the demon were a self-fulfilling prophecy, in large part because Saul believed them and acted accordingly. Now, I want to write about something that most Christians don’t talk much about: Suicide. It’s right there in the text, so I think the Holy Spirit wants to deal with the subject. But before we get into it, let’s get one thing clear. You may have known someone who committed suicide. Sadly, I’ve known several. It doesn’t do anyone any good to wonder whether that person died in faith, or if he went to hell. That’s not the point of what we are about to consider. What’s done is done. I cling to the biblical truth that God is far more gracious and merciful than I can comprehend. But right now, I want to talk to and about the living. If you are reading this, you are alive, and these words are for you, not for someone who has already died. Don’t waste your wondering how to apply these words to someone else – these are for you, for me, for the living. Saul’s suicide was clearly an evil, demonically influenced act. It was his lack of faith that prompted him to take his own life. It was his lack of trust in the Lord, combined with the fact that he believed and agreed with demonic words. He acted as he believed. If you are ever tempted to suicide, please understand – you are being tempted by a demonic power. Do not listen to demons. Do not agree with them. The man who kills a man, kills a man. The man who kills himself, kills all men; as far as he is concerned, he wipes out the whole world. His point is clear, but we don’t often think about it. The person who commits suicide does not merely kill herself. From her point of view, she is killing the whole world. Her intentions are as demonic as Hitler’s (who also committed suicide, by the way). Suicide looks at the world and says, “As far as I am concerned, there is nothing worthwhile in the entire universe. I would be just as well off if the whole world is destroyed.” If that doesn’t sound like Satan, I don’t know what does. It is not a private decision that affects only yourself. It is a cruel and arrogant judgment against the entire world. Sometimes the suicidal person knows this. They are angry at loved ones, and they want to hurt those people as well as themselves. Suicide is not just self-destruction – it destroys everyone who knows you. If that doesn’t sound demonic, I don’t know what does. Some Christians may say: “Well, I want to get to heaven. I’m tired of the struggles of this world – I want to be in the peace and rest of eternity with Jesus.” But that is so much like Saul’s attitude. Saul always insisted upon his own way. He manipulated, fumed and got depressed and sought help from demons – all to get his own way. Like the ultimate spoiled brat, when he realized that this time there is simply no way it is going to happen, he would rather die. We Christians are supposed to live in trust – not in control. We don’t get to determine how and when we die. To do that is to put yourself the place of God. A martyr is a man who cares so much for something outside of him, that he forgets his own personal life. A suicide is a man who cares so little for anything outside him, that he wants to see the last of everything. He even mentions the battlefield. This is how Jonathan acted, and how Saul should have acted. A solider surrounded by enemies, if he is to cut his way out, needs to combine a strong desire for living with a strange careless about dying. He must not merely cling to life, for then he will be a coward and will not escape. He must not merely wait for death, for then he will be a suicide and will not escape. He must seek his life in a spirit of furious indifference to it; he must desire life like water and yet drink death like wine. Even so, Saul’s story ends with people who loved God mourning for him. I think this is because they were led by the Holy Spirit. God always wanted Saul to turn to Him and trust him. And so after he dies, the Spirit of God moved two groups of people to honor Saul in a special way. After the battle, the Israelites in the nearby parts of Jordan valley fled. The Philistines took over their towns, among them a town named Beth-Shan, which has been the site of an archeological dig for many years in modern times. They found Saul’s body, cut off his head, and hung the corpse on the wall of Beth-Shan. There is a reason that we call brutal, ignorant cruel people “Philistines,” even today. They did the same with Saul’s sons. 19 The splendor of Israel lies slain on your heights. and the daughters of the uncircumcised will gloat. the shield of Saul, no longer anointed with oil. from the bodies of the mighty. they were not parted in life or in death. who decked your garments with gold ornaments. 25 How the mighty have fallen in the thick of battle! 26 I grieve for you, Jonathan, my brother. and the weapons of war have perished! The greatest tragedy of Saul’s life is that the Lord always loved him, continually reached out to him, never stopped offering his grace – and yet Saul refused it, preferring to try and control things himself. He did not surrender his own will to God. But God’s love and grace and forgiveness were never more than heartbeat away, if only he had turned to receive them. And so when Saul died, the heart of God was to lament his loss. Pastor Tom is an excellent teacher. His posts are always good. Thank you Pastor Tom, for sharing your feelings and thoughts with us, yes the difference with Saul and King David was that although both had sinned greatly David came to heart repentance Saul didn’t. I agree we cannot judge anyone’s eternal Destiny and God tells us not to do this, they many come to heart repentance on their deathbed, only God knows their heart. I want to share with you Pastor Tom my struggle with suicide, the last time was when I found myself strongly addicted to Gambling which had destroyed my marriage my whole life and my belief in myself as a person of worth I felt no one could Love me especially God but He knows those who are His, even before we are Born, as He knows all things but He Loves everyone even those who will perish eternally, He can be no other way He is Love but yes as you said He grieves greatly as we do for those we Love who choose to walk in sin. God had rescued me from death before but this was differant, I had decided to throw myself under a Truck but as I stepped out on the road I thought what if that Truck Driver tries to avoid me and hits someone else, I was not willing for anyone else to die or be hurt for the evil that I had done and I went back to my Hospital room having been ill for some time and found a Gideon’s Bible … God’s Word spoke to my heart assuring me that the Prayers of those who Loved Him would be powerful. I phoned a Loving, caring Elder and confessed to him he was shocked I then came to heart repentance, Colin anointed me and prayed. I have never gambled since then but also within a short time after this I was Miraculously healed of two life threatening Illnesses, both were well documented at the time, one I was to shortly have open heart surgery for and the other Chronic Asthma which had been witnessed by many over the years and had almost caused me to die more than once. I have also been healed more times since them and God is the only Healer as all good things come from Him, although Satan does deceive, by lies, tricks and illusion, he does evil for evil ends, God can do no evil. We may give up on ourselves but God doesn’t, He knows those who are His, Satan cannot take our lives as God told him, in reference to Job even though he puts us to the test. If we are a Redeemed Child of The King of Kings, Lord of Lords He will deliver us and conform us into the image of Jesus Christ. Sorry I should have added Pastor Tom, in regards to those who have suicided, Satan cannot cut short our lives until our appointed time on earth has finished but God can extend life or end it, He knows our heart but if someone has died because of suicide, we don’t know now were their souls went and if they went to hell we will never know as the Scriptures clearly tell us. Thank you for your comments Anne. I agree with you — it is not for us to judge the spiritual condition of someone who has committed suicide. I am continually amazed at how great and loving and gracious God is. Some people may see this passage portraying a judgmental God, but I see at as proof of his overwhelming love for us.